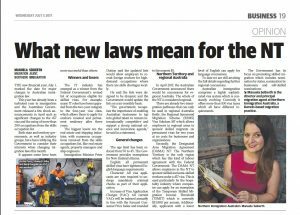 Today, Northern Immigration Australia’s director and Principal Migration Agent, Manuela Seiberth has been published in the NT News about the changes in Australia’s Immigration Laws introduced on 1 July 2017. We understand the changes are causing confusion and uncertainty for both, employers and applicants. Please contact us if you have any questions, or would like assistance with your visa application. We are happy to help! The new financial year, July 1, marked the date for major changes in Australian immigration law. This year has already been a turbulent year in immigration and the Australian Government released a few shock announcements in April such as significant changes to the 457 visa and the axing of more than 200 occupations from the skills occupation list. Both state and territory governments, as well as industry groups, have been lobbying the Government to consider their interests when changing migration laws this month. It appears some have been more successful than others. The IT industry has emerged as a winner from the Federal Government’s revised list of occupations eligible for skilled visas. For example, many IT roles have been upgraded from the two-year category to the four-year visa class, which allows them to apply for onshore renewal and permanent residency after three years. The biggest losers are the real estate and shipping industries, with numerous occupations removed from the skills occupations list, like real estate agents, property managers and ship engineers. Immigration Minister Peter Dutton said the updated lists would allow employers to recruit foreign workers for high-demand occupations where there are skills shortages locally. He said the lists were designed to be dynamic and the Government will update the lists on a six-monthly basis to ensure the best outcomes for Australian workers and employers alike. “The government recognises the importance of enabling Australian businesses to tap into global talent to remain internationally competitive and support a strong national science and innovation agenda,” Dutton said in a statement. Age limit: reduced from 50 to 45 years old. The Australian Government provides exemptions for NZ citizens. English: all permanent skilled visas have tightened English language requirements. Character: All visa applicants are now required to undergo mandatory criminal checks as part of their application. Increase of Visa Application Charges (VAC): All current VACs will be indexed annually in line with the forecast Consumer Price Index and rounded to the nearest $5. In April 2017, the Australian Government announced that there will be concessions for Regional Australia such as Northern Territory. The whole of the NT is considered regional. There are already two immigration pathways that can only be used in Regional Australia: firstly, the Regional Sponsored Migration Scheme (RSMS) Visa Subclass 187 which allows employers in regional areas to sponsor skilled migrants on permanent visas for two years at no costs for businesses and organisations. Secondly, the Designated Area Migration Agreement (DAMA) NT: The Northern Territory is the only region which has this kind of labour agreement with the Federal Government. The DAMA NT allows employers in the NT to sponsor skilled and semi-skilled workers under a 457 visa. This is used particularly by the hospitality industry, where companies can apply for an exemption of the Temporary Skilled Migration Income Threshold (TSMIT) which is currently $53,900 per annum. Additionally, applicants with a lower level of English can apply for language concessions. To date we are still awaiting the full details regarding further regional concessions. Australian immigration comprises a highly sophisticated visa system which is constantly evolving. Currently it offers more than 100 visa types which all have different requirements. The Government has its focus on promoting skilled migration which includes nomination by states, nomination by businesses and self-skilled nominations. This gives us hope. My daughter who is into culinary and is in the US for now wanted to come over here in Australia. What sort of visa is best applicable for her. Thanking you much in advance for any favour extended. We are more than happy to provide you and your daughter with more information on Australian visas and immigration pathways. In particular, we are specialists in immigration to the Northern Territory. Please book an appointment for a visa assessment & consultation. There are more than 100 different types of Australian visa. In the visa assessment & consultation we analyse visa options and requirements in depth. We explain everything in detail and make recommendations. Please let us know when you would like to book an appointment. The visa assessment & consultation can be conducted by phone, Skype, email or face to face if in Darwin.